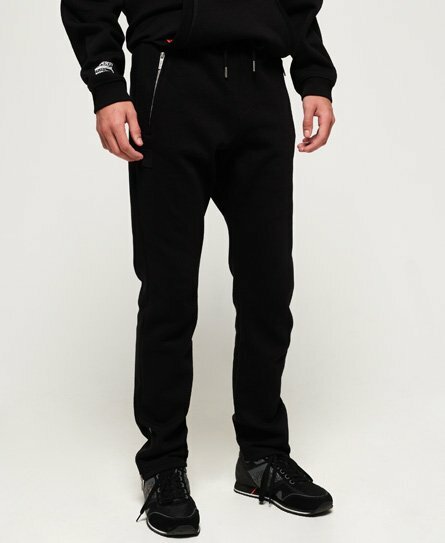 Superdry men’s Black Label Edition joggers. These joggers from our limited edition Black Label range will inject a welcome dose of stylish minimalism back into your wardrobe. They feature a drawstring waistband, two zip pockets and zipped ankles. In addition, these joggers have been decorated with Superdry logos below the waistband, on the thigh and a logo adjacent to the zip on the ankle. For the finishing touch, these joggers have been completed with branded Superdry zip pulls to create a flawless finish. Complete the look with an oversized sweatshirt or hoodie and trainers to channel the athleisure trend.